One of our favorite wineries (we still have so many more to explore) is Del Rio Vineyards and Winery. On our very first visit to Del Rio we knew we had found someplace special so we became members right then and there. Since then, we have gone back many times and we highly recommend Del Rio to our guests as well. On our recent visit to pick up our club wine selections, we were invited to take a group tour of the vineyard and winery. It was a particularly cold and blustery day, but the tour was well-worth braving the not so ideal weather and Jennifer, our tour guide, gave our group a private tasting, lucky us! The inner workings of the winery is an impressive enterprise. Here are a few photos to help entice you. 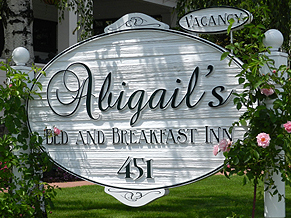 And if these photos aren't enough, when you book a room with us here at Abigail's, we'll send you wine tasting at Del Rio, on us! What are you waiting for?! Hattie Beach, also known as the Del Rio Stage house ghost. Reminds me of a giant Tonka toy, but it is the new harvester. Drives right over the vines while someone walks ahead to watch for rocks and other unwanted objects. The floor, where the driver sits, is glass so he/she can look down over the vines. Storage tanks, can't quite remember what Jennifer said they hold... along the lines of 15,000 gallons? The doors were made from the wood of the original building floor, turn-of-the-century. Yes, that is ice! It is the process of cold stabilization. This is a photo of the same vineyard, taken last summer. I need a panoramic lens to capture the perfect alignment of the surrounding hills. Trust me, it is picture perfect!